OTTAWA – Craig Savill made a triumphant return to the Tim Hortons Brier Thursday night, a brief one but impressive and emotional one. A long-time member of Glenn Howard’s Ontario foursime, the two-time Brier and world champion entered the game in the eighth end of the Ontario-Team Canada match to a standing ovation from the 5,130 fans at TD Place. He threw two rocks, a perfect guard and then a draw to the four-foot before returning to the bench as Howard’s fifth man. 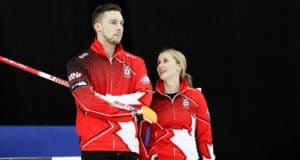 Savill’s curling career was interrupted late last year when he found out he had cancer — Stage 2B of Hodgkin’s lymphoma — and has been receiving chemotherapy treatment in Ottawa since December. Savill entered the game after Ontario had scored four in the seventh end to take an 8-4 lead in their game against Pat Simmons and Team Canada. “Incredibly emotional,” Howard said of the moment. “We talked about having him out here all week and we made an agreement with Team Canada to bring him in as a token fifth for everybody. I got pretty emotional just to watch him come out but he held it together somehow. A lot of the players were teared up. Just to see him come out and looking good and feeling good and to throw the rock with us, just like old times. In the key match of the night, Brier rookie Mike McEwen of Manitoba scored four in the eighth end to overcome a tough Jean-Michel Ménard and his Quebec team that was fighting desperately to retain its slim hopes of making the playoffs. 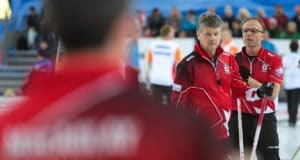 Quebec had to beat Manitoba, but McEwen’s 8-6 win improved his record to 7-3, ensured him of a spot in the Page 3-4 game on Saturday and ended any possibilities of tiebreakers. McEwen, third B.J. Neufeld, second Matt Wozniak, lead Denni Neufeld and alternate Jon Mead, finish their round-robin Friday morning and will play Kevin Koe of Alberta (8-3; Calgary) in the Page 3-4 game at 2:30 p.m. (all times ET). 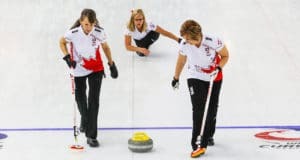 McEwen fell behind Quebec 3-1 after four ends, having to make a raise takeout in the fourth to hold Quebec to a steal of just one. But he pulled even with a deuce in the fifth when he managed to split the house and Quebec left him with a routine hit-and-stick for two. After trading deuces, McEwen punched his ticket to the playoffs with the four followed by a steal of one in nine. In the other Friday night games, Brad Jacobs of Northern Ontario won his 10th straight game 10-5 over New Brunswick, Koe beat Steve Laycock of Saskatchewan (5-6; Saskatoon) while Canada (6-5; Calgary) scored two in the 10th end to nip Howard (4-7: Etobicoke) 9-8. Not playing in the evening draw were Brad Gushue of Newfoundland-Labrador (9-1; St. John’s), Jim Cotter of B.C. (2-8; Vernon-Kelowna), Adam Casey of P.E.I. (2-8; Charlottetown-Summerside) and Jamie Koe of Northwest Territories (2-8; Yellowknife). The final round-robin draw is Friday at 9:30 a.m. The Page 1-2 game goes at 7:30 p.m. ET. Northern Ontario and Newfoundland/Labrador will meet twice on Friday — in the 9:30 a.m. round-robin draw, and then again in the Page 1-2 game. TSN (RDS2 in French), the exclusive television network for Curling Canada’s Season of Champions, will provide complete coverage of the 2016 Tim Hortons Brier.